When you want to create adaptable operations, modular systems are the key. You can easily move, reconfigure and replace panels, doors, walls and windows. You can add to your footprint with relative ease--especially compared with expensive new construction or wholesale facilities changes. 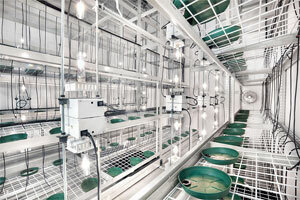 You can relocate a modular clean room/grow operation entirely if that's what is required. This allows you to lease or purchase new facilities for expansion at a much lower cost. As states come online with various cannabis regulations, speed to market may determine which companies win in a "gold rush". You can order, install and use PortaFab modular systems with relative ease and little disruption. In some instances you can create grow facilities within an existing space for multi-use situations. The pre-engineered, modular components make this easier. These structures are ideal for multi-level facilities, allowing you to integrate them with mezzanines or dual-level operations to use every inch of vertical space available. As the industry evolves, regulatory pressures will change, and indoor growth means you have more control—and more ways to adapt to changes—than any outdoor operation. But most importantly it gives you greater control over your crop, your time and your profitability. Control environmental conditions: This means you can control temperature, lighting, humidity and access during all aspects of cultivation. With PortaFab’s cleanroom systems, control is built in. Control pests and parasites: Spiders, mites, thrips, flies, gnats—and many others—can destroy an entire crop, or cause you to need expensive countermeasures. Indoor growth minimizes the chances of these issues. Modular clean rooms further press your advantage. Control airborne pathogens: A variety of airborne pathogens (Verticillium, mildews, Botrytis and others) are a serious threat to valuable crop. This is another area where indoor, controlled growth minimizes risks and creates the healthiest possible environment. Control regulatory standards: you can comply easier with cGMP (Current Good Manufacturing Process) and other other FDA or USDA standards within a clean, modular environment than you can outdoors. Adherence may or may not be mandatory in your state, but someday might be nationwide. Consistency is critical: When you can dictate the environment, you can create a more valuable yield that consumers will identify and flock toward. Harvest more crops per year: Since you are indoors and aren’t subject to the whims of Mother Nature, you can add extra harvest cycles and continuously produce more crop and profit every year. Control access: Security is an obvious and ongoing issue at cannabis facilities. Indoor facilities using modular buildings are much easier to lock, surveil, and control than outdoor facilities—or even indoor grow centers that occupy the center of a building where access is easier.